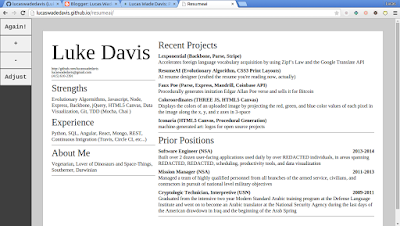 ResumeAi is a tool I built for dynamically generating novel resume designs. It takes in your data (click the adjust button on the left) and fiddles with the parameters of the design every time you press Again! It works offline (using the awesome appcache) and remembers things you change (using local storage - my info is default). And when you're ready to print the page, if it doesn't fit perfectly on the number of pages you want, just press the + and - buttons to manipulate the font size until everything's in the dimensions you're happy with! 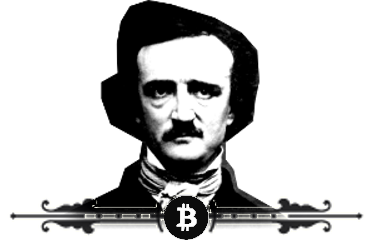 I did Faux Poe with a couple buddies, it's a way to sell procedurally-generated knock-off Edgar Allen Poe poetry for bitcoin (using the Coinbase API). The poetry generator I wrote can be pulled from NPM or Bower on it's own (npm install faux-poe). I love procedural generation! 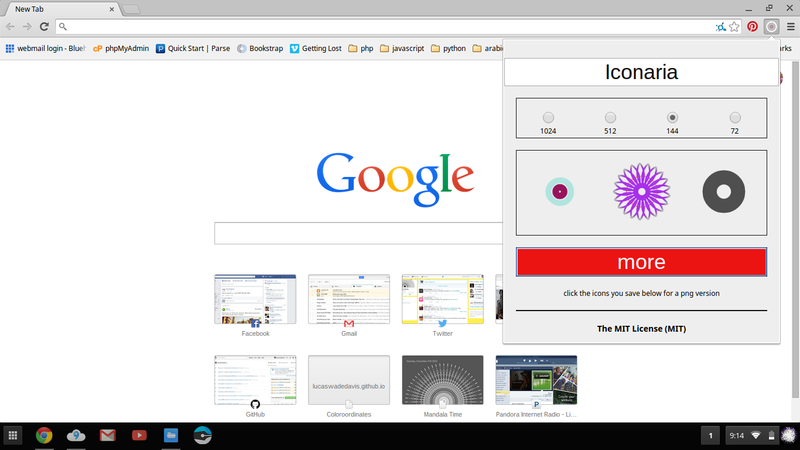 Iconaria is a Chrome extension that creates unique icons on the fly. 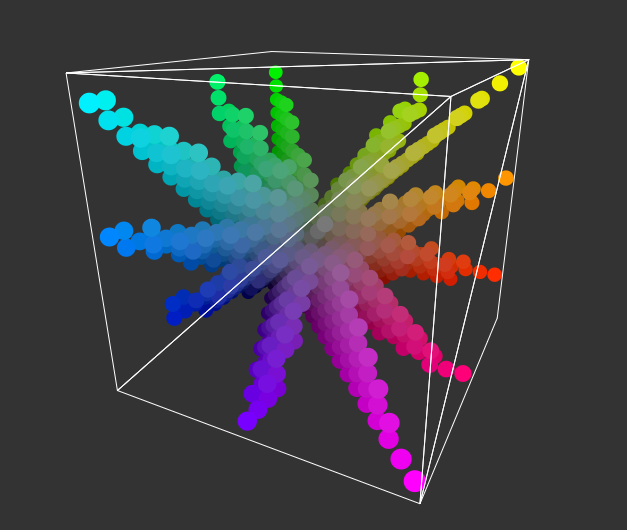 Inspired by a technical vignette in Neal Stephenson's Reamde, I built Coloroordinates a little tool that will display the color distribution of an uploaded image in 3 space*, projecting the red, green, and blue values of each pixel along the x, y, and z axes respectively. 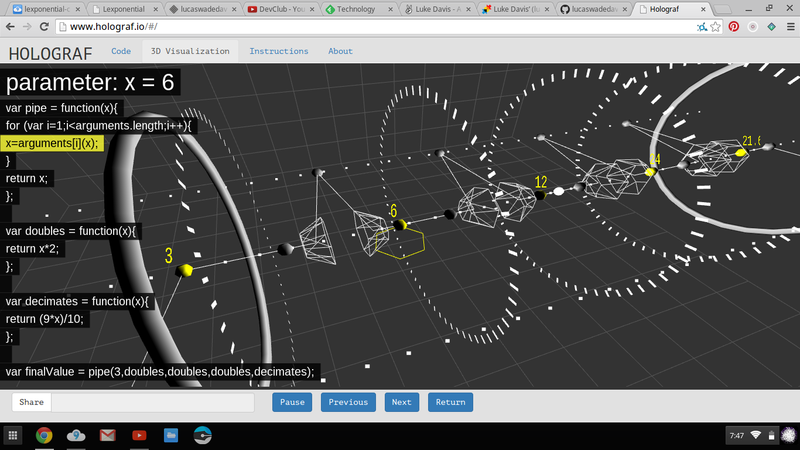 *caveat emptor: displaying things in 3d in the browser is kind of difficult and relies on technology that didn't exist until a few years ago, as such I recommend using an up-to-date version of Chrome or Firefox on an OS newer than windows XP to view the application. 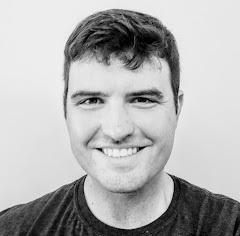 I was so inspired by Jürg Lehni and Otto, his beautiful robot at the Long Now Foundation, that as soon as I left our first introduction, I raced home and dove into Paper.js - his vector based library for illustration and animation with the HTML5 canvas element. 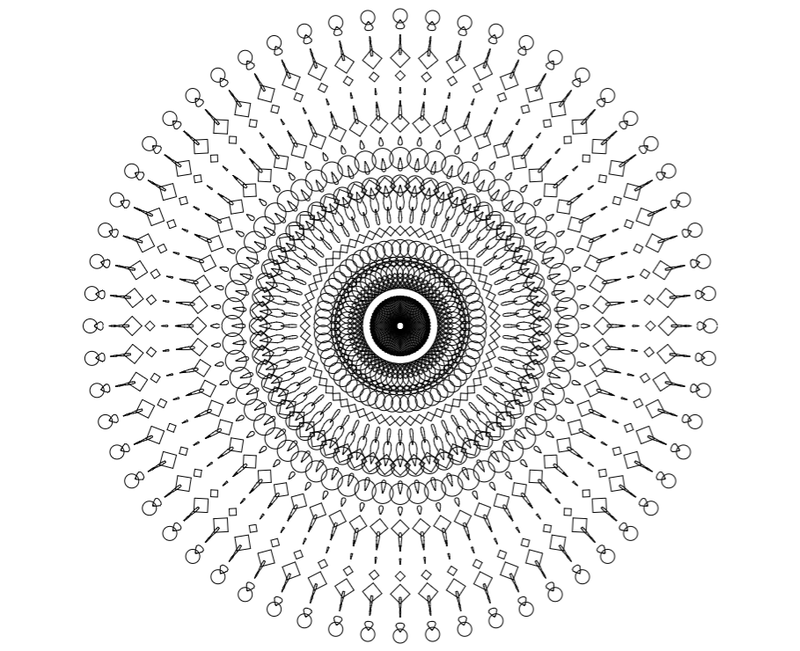 Paper JS feeds vector art to Otto the robot, so I used it (the library - not the robot) to build an application I call Mandala Time. I imagine Otto drawing one shape per minute throughout the day. A never-repeating art-piece in the spirit of the Long Now Foundation.